Every cyclist wants to become a better cyclist. We would also like to be faster, but getting faster requires training, and that involves time and pain. Getting better, on the other hand, requires the acquisition of knowledge and skills that cause one to appear faster. Entire blogs are devoted to the subject of becoming a better cyclist, and it’s the reason that there are more bike blogs than there are actual cyclists. I’ve been curious about embrocation for a while. As far as I know, no one I ride with uses it. This means it could make me a better cyclist. So, I recently decided to try some. I ordered a couple varieties from Mad Alchemy that should arrive this week, and I bought a stick of Enzo’s from Emery’s. I tried the Enzo’s this past Saturday. I applied it as directed, rubbing it in while wearing latex gloves to keep from accidentally getting it into places where it didn’t belong. The process took about two or three minutes. The smell was strong but not unpleasant. I thought it kind of smelled like a spice-scented candle, or like cinnamon-flavored medicine (if such a ting exists). My wife, Kelley, had a more defined opinion. She gagged, grabbed our 22-month-old son, and promptly left the room, just managing to utter “truck stop hippie puke”. The temperature was in the low 30s, so I chose to wear some light tights over my bibs rather than just relying on the embro alone to keep my legs warm. I can’t say I felt anything in the first hour or so, except for a slight burning around my ankles. When I got home three hours later, I discovered that it was coming from the area under my socks’ elastic. On the positive side, I did notice that my legs felt pretty loose during the ride. I’d been off the bike for about a week and a half, so it could have been that I just had fresh legs. Whatever the cause, I felt good and not the least bit cold. I'm lucky my chain didn't rust. The end of my ride was just the beginning of the adventure, however. I had been warned that a hot shower would multiply the burning effect of the embrocation exponentially. Following some advice I’d read online, I applied dish soap directly to my legs before getting in the shower. I then ran some cool water and wiped my legs down with a washcloth. So far, so good. However, things got interesting once I got under the water. As predicted, I suddenly felt like a herd of ferile cats was using my legs as scratching posts. I had to stay out of the direct stream of the shower, so I washed myself one limb at a time under lukewarm water. This was considerably less pleasant than the long, hot showers I like to indulge in after a ride out in the cold. Fortunately, my ability to drink beer in the shower was not affected. 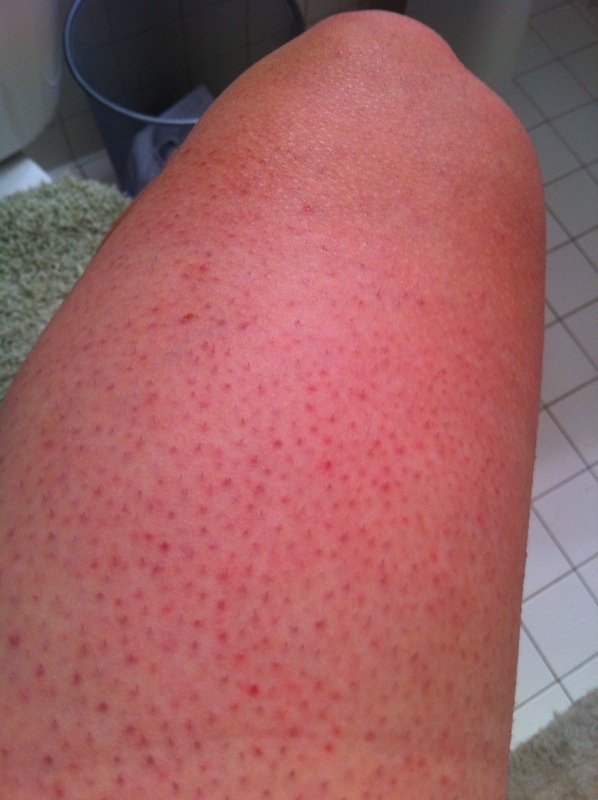 After I dried off, all that remained was a pleasant warm feeling on my legs. This lasted for about one hour. To Kelley’s relief, only a hint of of truck stop hippie puke aroma remained. My experience wasn’t positive or negative enough to render a verdict after a single ride, so I’m going to reserve judgement until I can get out for some more embro-assisted rides. That said, I’m not sure that the benefit embro (supposedly) gives me while on the bike outweighs the pain of being denied my hot post-ride shower. Next time out, I’ll keep the embro off my sock area, and I may try to apply less but spend more time rubbing it in. I’m also going to follow Enzo’s recommendation to use rubbing alcohol to remove the embro before hopping in the shower. A couple of questions occurred to me during and after my ride. First, how horrible would it feel to crash and get road rash on embro-coated legs? Second, if water “activates” embro, what would happen if it started to rain? I’m guessing cool rain water wouldn’t be as painful as a hot shower, but embro in an open wound could be more painful than listening to Craig Hummer’s live Tour de France commentary. I hope someone is able to answer the second question reassuringly and that no one ever has experience with embro and road rash. I also wonder how soon embro can be used after shaving one’s legs. I’ll post again after my next ride, hopefully with a review of one of the Mad Alchemy products. I’ve already reassured Kelley they won’t smell as bad as the Enzo’s stuff. It seems like a safe bet that nothing could smell worse than truck stop hippie puke.